Todd Lappin here, blogging in my official day-job capacity as the editor of Everywhere, a user-generated travel magazine based here in the city. 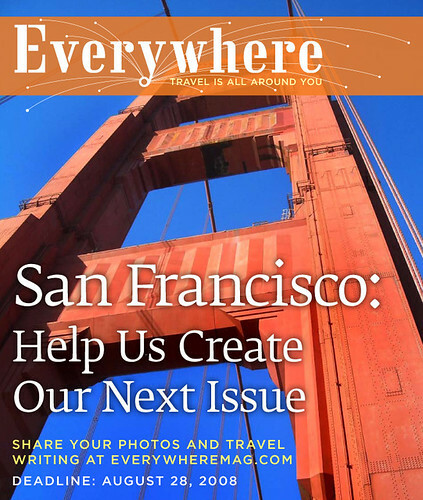 I mention this because the next issue of Everywhere will include a feature story about travel to San Francisco, and we’d love to get more article and photo submissions from SF locals. The basic idea behind Everywhere is pretty simple: Every two months, we create a glossy print magazine from articles and photographs contributed by members of the online community at everywheremag.com. The community votes on their favorite contributions, then we curate the best of the best to produce an inspiring travel magazine that looks fabulous on your coffee table or in your private jet. Published contributors receive $100 and a free one-year subscription. Our San Francisco package will be a collection of articles, photos, and tips about how to enjoy San Francisco like we do as locals. Think of it this way: When your friends come to town, where do you encourage them to go? What neighborhoods, stores, restaurants, bars, or events do you put on your must-see list? The quirky, the offbeat, and the unexpected are most welcome. SF’s best places to hide on a foggy day? 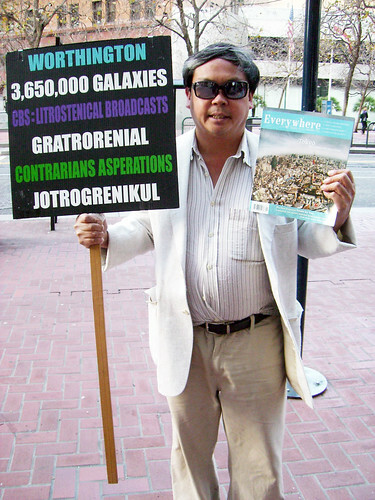 A visitor’s guide to understanding Frank Chu? The battle of the best burritos? The city’s most under-explored neighborhoods? Have fun and surprise us. Submissions can be as simple as a single photo (with a good caption, please), or you can add a place to our local guide map, or you can get your prose on and write an article. If you’ve ever wanted to get published as a travel writer or photographer, here’s your chance. Just create a free account at everywheremag.com, and contribute away. The deadline for submissions is August 28, 2008.